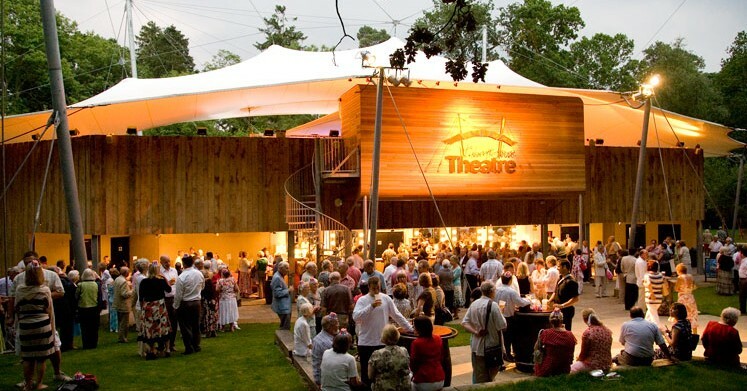 Every visit to Kilworth House Theatre is a unique experience. It’s an opportunity to enjoy a professional production of a standard rarely seen outside the West End amidst the stunning surroundings of a beautiful theatre set in a peaceful wooded glade in the forty acre Kilworth estate. So why not complete that experience by enjoying pre theatre dinner or lunch in the magnificent Orangery or Wordsworth Restaurants at the luxurious, award winning Kilworth House Hotel. The hotel is situated just a few minutes walking distance from the theatre and after the meal we can also take you by golf buggy from the hotel to the theatre entrance. As you may imagine our pre theatre dinners and lunches are a very popular option and book up very quickly. So we would strongly advise you to book for pre theatre dinner at the same time as booking your theatre seats. The Hotel on occasions will be closed for exclusive use and we recommend that prior to visiting, if a booking hasn’t been made to call the Hotel for confirmation of opening. 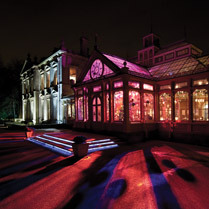 Built in 1880 the Orangery Restaurant at Kilworth House Hotel is a magnificent example of Victorian architecture. Painstakingly restored to its former glory the Orangery has become a destination venue in its own right – light, bright and airy by day and glitteringly romantic by night. Guests can dine here beneath the Orangery’s ceiling of glass, timber and ornate wrought iron. On certain evenings dinner may also be served in the stunning Wordsworth or Library restaurants at the hotel. Pre-theatre dinner £32 per person Pre-theatre lunch £28 per person To book a table please call 01858 881939. Capacity for our pre-theatre dinner is strictly limited. We would, therefore, strongly recommend you book your pre-theatre dining arrangements at the same time as you book your theatre tickets. This may be done online or by telephone. Guests for pre-theatre dining in the Orangery or Wordsworth restaurants are seated between 5.00pm and 5.30pm, and between 12 noon and 12.30pm for lunch. It is recommended not to arrive later than these given times. If you have already booked tickets for a show and now wish to book pre theatre dining for that date below please click on the link below. You will be taken to a calendar view of the theatre season and you firstly need to go to the top right of the page to change the date to the one you wish to book for. This will then display your dining options and availability for your chosen date. Bring Your Own Picnic A special picnic area on the Kilworth Estate is set aside for those who want to bring their own picnics. A certain amount of tables and chairs will be laid out on the lawns. We cannot, however, guarantee the availability of tables and chairs. The gates open to the picnic area at 5.30pm*. Toilet facilities are available nearby. Please note alcohol, food and glasses are not permitted beyond the ticket office / entrance to the theatre complex. We respectfully request that all picnic items are returned to your vehicles before entering the theatre. *Gates open to the picnic area at 12 noon for matinee performances. 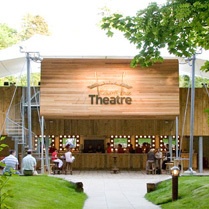 The theatre bar will be open one hour before the show serving tea, coffee, hot chocolate, ice-cream and a small selection of snacks in addition to alcoholic and soft drinks. The Staging Post is open after each show to theatre guests serving alcoholic and soft drinks, tea, coffee and hot chocolate and is also available during the interval and pre-show if not subject to a private booking.